i’ve been making my own homemade applesauce for years. even before i was married and had kids, i would make huge batches of it in my mom’s kitchen. so, once my kids came along i was already in the habit of making it and would feed this to them instead of buying the overpriced baby food at the store – and the really nice thing is that i knew it was 100% natural…there is nothing added, not even sugar or cinnamon, though you can certainly add those in if you wanted. but i always found that this applesauce was sweet enough, all on its own. 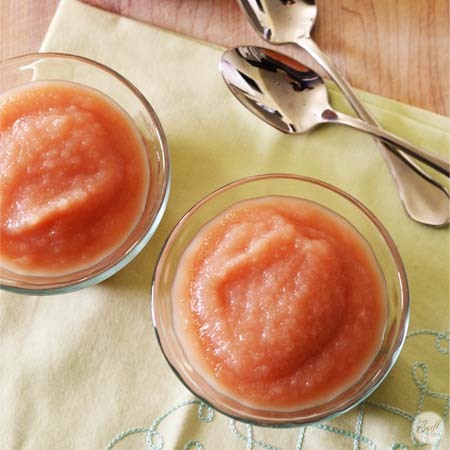 you might notice in the photos that my applesauce is pink – you can get it this color by adding strawberries, but all i do is leave the skins on and let their red color tint the applesauce (kind of like the way you might use tea, or onion skins, or purple cabbage to color your easter eggs). 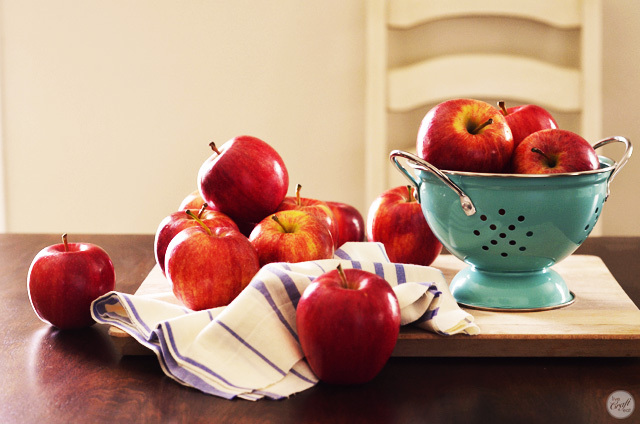 all i ever need to make this recipe is apples…lots of red-skinned apples. it’s a great way to use up excess apples that may have lost their perfect “crunch” for eating by hand, or ones that might have a few bruises. 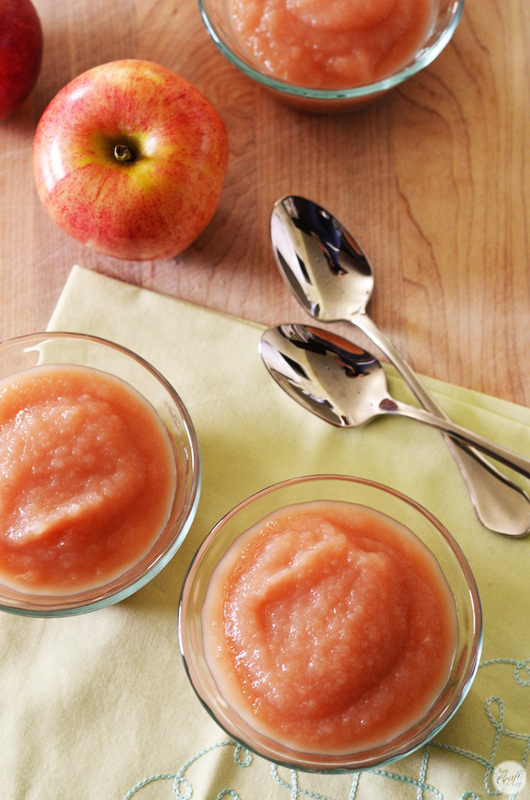 if you want pink-colored applesauce, leave the skins on. just make sure to wash all your apples. 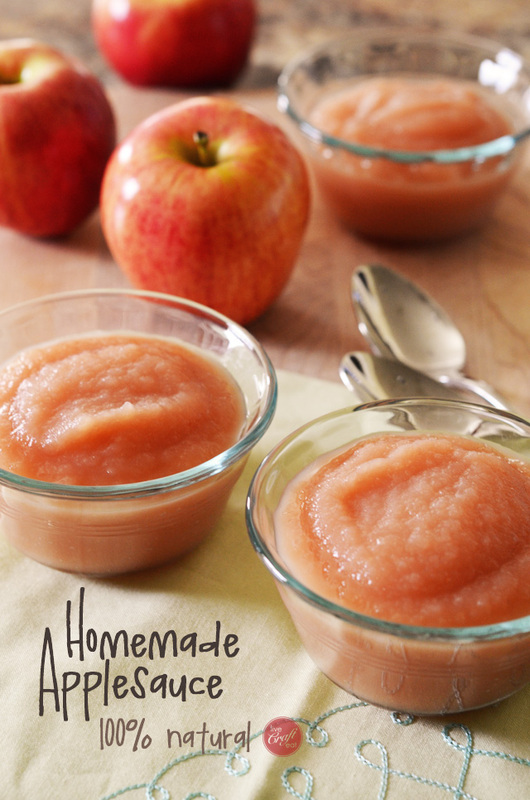 if you don’t want them pink and prefer the normal applesauce color, peel all your apples before chopping. since i’m going to be chopping a lot of apples i try to streamline the job as much as i can. it’s so much easier, faster, and safer to cut anything when it has a flat side to lay on the cutting board. 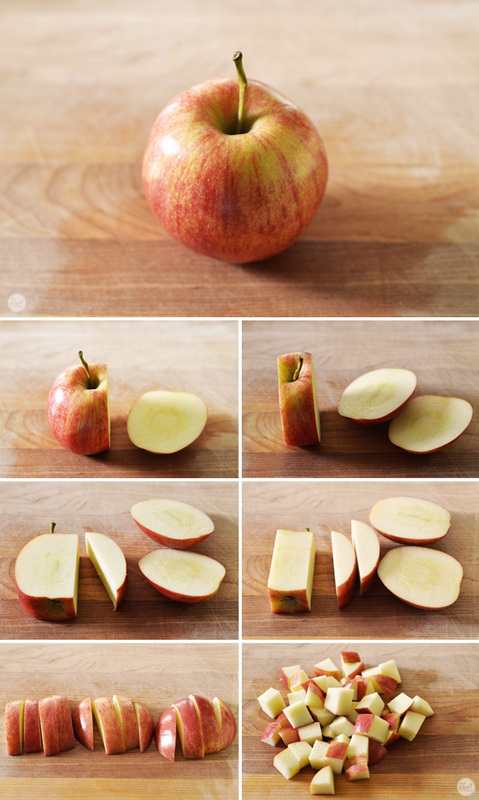 the pictures below show how i cut my apples. it’s nothing earth-shattering, i know, but it’s really efficient and gets the job done quickly. 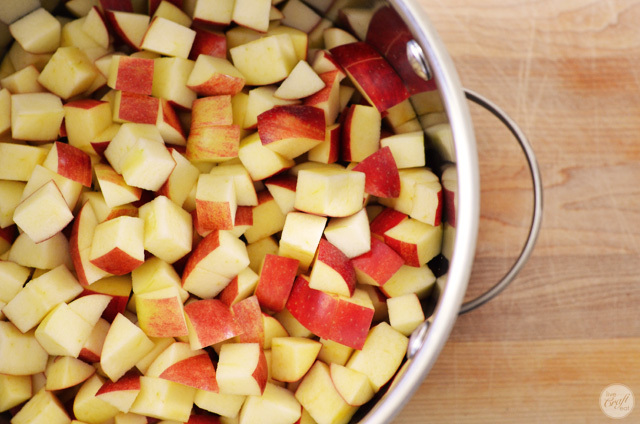 once they’re all chopped, place the apples in a large pot. to this, you will need to add about 1/2 – 3/4 cup of water…just enough to cover the bottom of the pot. the apples will produce their own juices to keep them from burning on the bottom, but they need a little jump start before they get to that point. cook the apples over medium-high heat until they get really soft. you can see the color of the skins start to change, the apples will let out some of their juices, and the texture will shift from crunchy to really mushy. this will take about 15-20 minutes. this next part is a little time consuming, or rather, it’s takes a bit more effort on my part than i usually want to do. i’ve been thinking about getting a food mill, like the one here (aff link) and all i would have to do is add the apples to the food mill and process. job done! but since i don’t have a food mill (yet) once the apples are really soft and falling apart, i transfer a cup or two to a blender and pulse a few times until i don’t have any huge chunks of apple left. then i transfer it to a sieve placed over a mixing bowl and using a spoon or a ladle i push as much as i can through the sieve. 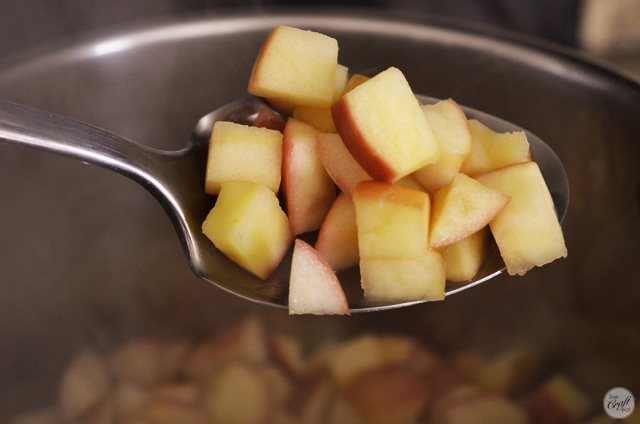 repeat this process between the blender and sieve until all your cooked apples are gone. note: you’ll be left with quite a bit of pulp – all the time you saved by not having to peel the apples at the beginning is now sitting in front of you and it’s time to separate the apple sauce from the skins. when you’re finished getting all your applesauce in the bowl (don’t forget to scrape the good stuff from the underside of the sieve!) it’s ready to chill in the fridge for a couple hours before serving. when you’re ready to eat, it will be pink and smooth, naturally sweet and delicious. try your own variations by adding other fruit, cooking or softening the fruit as needed. some of our favorite combinations are: apple/banana, apple/pear, apple/peach, apple/strawberry…. whatever combination you use, you can know that this snack is healthy and delicious and your family will love it! cook apples in a large pot with ½ - ¾ cup water over medium-high heat until soft, about 15-20 minutes, stirring occasionally. 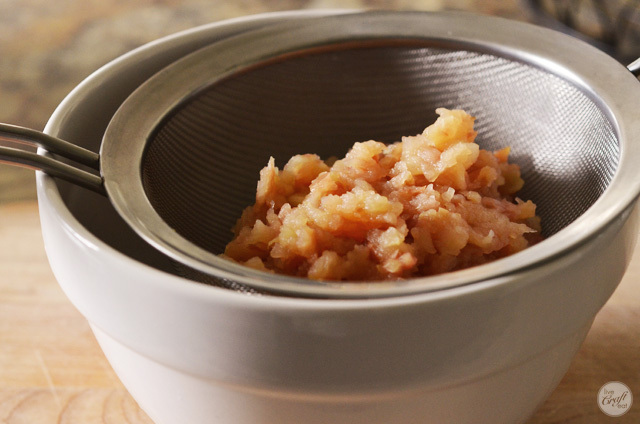 option 1: use a food mill to strain applesauce. option 2: pulse cooked apples in small amounts in a blender and strain through a sieve with a spoon, repeating process until all apples are gone. cover and refrigerate applesauce for 2 hours. serve chilled. can this applesauce be used in a recipe that calls for applesauce? I would think yes – it’s just apples, which is what store-bought applesauce is, minus all the preservatives. I would think yes – it’s just apples, which is what the store-bought applesauce is, minus the preservatives. 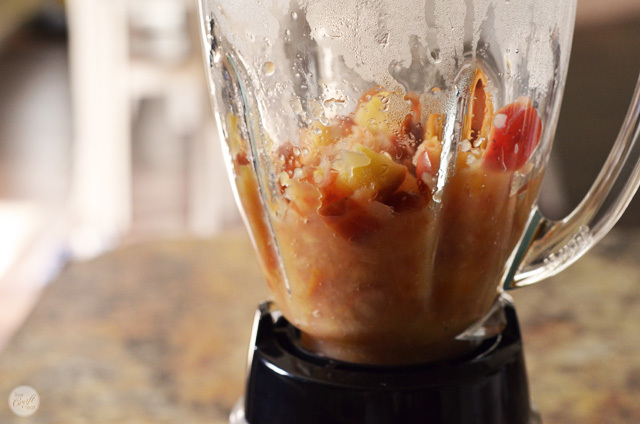 If you have a good blender you don’t have to cook them. Actually, once we didn’t even core them. I’ve never tried it with the reg. blenders though. It just kills me to take a perfectly yummy healthy apple my kids like and cook some of the nutrients out of it. what kind of apple did you use in the photo? How long does the sauce last for (shelf life) and presumably in the fridge rather than cupboard as there’s no preservatives? It should last a few days in the fridge or you are able to can it for a much longer shelf life. The shelf life would then be similar to any other canned fruit.